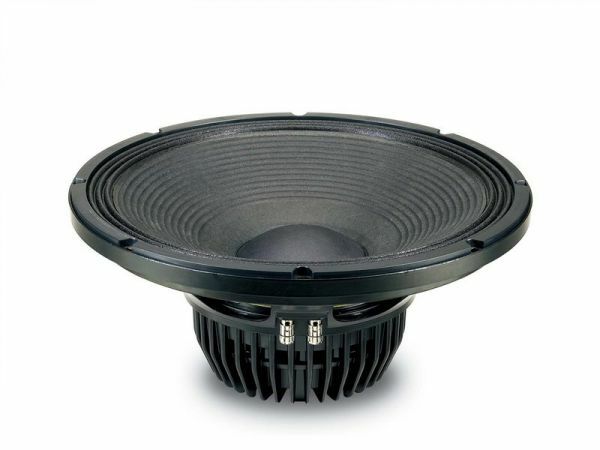 Produktinformationen "18s 15NLW9300 8 Ohm"
The 15NLW9300 is a low frequency loudspeaker which sets a new industry standard in 15" (380mm) neodymium 4" voice coil high performance transducers. The design has evolved from an extensive R&D program carried out at Eighteen Sound, providing clean, undistorted LF reproduction at very high SPL without damages. The transducer is mainly intended as woofer in compact vented enclosures (65 - 130 lit). The external neo magnet assembly assures high flux concentration, low power compression and excellent heat exchange, resulting in high levels of force factor and power handling with an optimum power to weight ratio. The aluminum heatsink has been specifically studied using F.E.A. simulators and the necessary heat transfer to the dissipative structure has been improved. The direct contact between the heatsink and the basket represents a fundamental improvement in voice coil heat dissipation. A special low density multi-cell material air diffractor has been also placed into the backplate venting hole, acting as a cooling system, furtherly increasing power handling capability and lowering the power compression figure. The suspension system has been designed to provide symmetric large signal behaviour throughout the whole working range, providing low harmonic distortion at different excitation levels. The 15NLW9300 features a dedicated exclusive carbon fibre reinforced straight ribbed cone, with a specific pulp formulation containing damping fibres. The membrane is impregnated with a proprietary resin mix in order to increase the cone bend performances - up to 6 times better if compared with traditional celluloses pulp, twice than glass fibre added pulps. The result is a very linear piston action across the entire working range reducing breaking modes, and makes the 15NLW9300 suitable for outdoor application. The performances are further improved by the proprietary Double Demodulating Rings technology (DDR), designed to reduce dramatically the intermodulation and harmonic distortion whilst improving the transient response. The 100mm (4in) copper clad aluminum wire Interleaved Sandwich Voice coil (ISV) provides high levels of thermal stability and durability. Weiterführende Links zu "18s 15NLW9300 8 Ohm"
Kundenbewertungen für "18s 15NLW9300 8 Ohm"